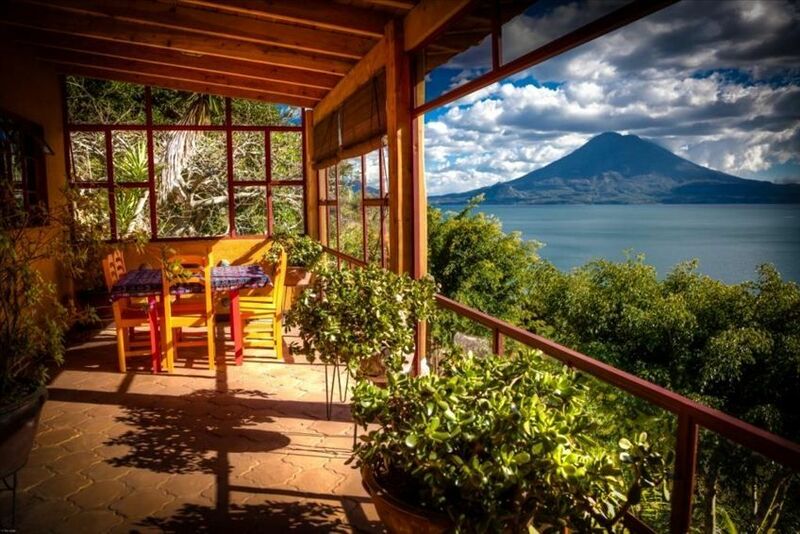 Villa Eggedal is one of the largest and most luxurious estates around Lake Atitlan. Spectacular is the only word to describe this ten acre walled villa located near the shore in the village of Santa Cruz la Laguna. This Mayan village is only accessible by boat, just a ten-minute ride from Panajachel and you’ll arrive to privacy, luxury, spacious comfort, incredible views of the lake, mountains and volcanoes, and immaculately tended gardens and grounds. Villa Eggedal is owned by a European aristocrat and art collector, and all the rooms are filled with beautiful antiques, paintings, rugs, sculpture, prints, and Mayan and world textiles. Casa Wenche is the most secluded of the Eggedal rentals. This two-bedroom home offers the best views on the estate and its simple luxury and idyllic garden surrounding make it the perfect retreat. Living room, dining area and kitchen are all combined in a spacious common room leading out onto a 32 square meter terrace with one of the most stunning vistas on the lake. The fully equipped kitchen and ample dining space make this an ideal setting for a family or group getaway, and art-filled walls and tasteful decoration abound. This well-appointed house measures 118 square meters (1270 sq ft) and offers space for five in total: one bedroom with a double bed and the other with one bunk bed and one single. The ample stone-walled bathroom is located just off the common room. An outdoor terrace and barbecue area flank the entrance to the house and provide yet another opportunity to enjoy the surrounding garden and majestic views. Small verandas, garden seats, patios, balconies, and shady lawn areas are nestled throughout the estate in a maze of winding garden paths. This is a paradise for birds and bird watchers alike with over 100 species spotted on the property alone. Papayas, avocados, citrus trees and a well-tended vegetable garden with fresh lettuce and herbs are all there for the picking to add some extra flavor to your sunset barbecue. Staff provides housekeeping twice a week, and services like grocery shopping, laundry service and additional house-cleaning can be arranged for an additional charge. Two studio apartments and a 4-bedroom home are also available on the estate, and Villa Eggedal can accommodate up to a total 17 people comfortably and privately. Villa Eggedal is owned by an aristocratic Norwegian art collector who visits for a few months every year. After first visiting the lake in 1980 he vowed to return one day. Since breaking ground in the 90's, the homes, gardens and decoration of this villa have been his labor of love. Looking for a place to live part of each year in paradise, and the sheer beauty of Lake Atitlan is unparalleled. As for climate, the Guatemalan highlands are known as the 'land of the eternal Spring' and the chirping birds, flourishing gardens and warm breeze are a welcome change from cold winters and city traffic. Although you're staying in a luxurious villa, you're by no means removed from local culture. A five minute walk to local restaurants, two minutes from a swim in the lake, and a 10 minute boat ride to the local market mean that privacy doesn't have to mean isolation. Linens will be changed twice a week with housekeeping. Laundry service available for additional charge. There needs to be more stars for this place. I have traveled around the world and never have I come across a property so special. Acres and acres of gardens and views of the lake so beautiful you feel like Alice when she went through the looking glass. My husband and I kept saying “this can’t be real.” It’s like waking up in a dream. The property manager Deedle made everything easy for us (let her set up your transportation, I made the huge mistake of getting an uber there and it was so much easier and cheaper leaving when we used her boat and car service). The owner Erick was around the property and made us feel like we were home the moment we got to the property to when we left. His warmth and hospitality made an incredible place even more incredible. We had almost all of our meals prepared by Emanuella who is an amazing person as well as cook. When she found out my husband loves bacon she went to the market and made sure to have it for him every morning. She was such a warm person to be around and you’ll want her to cook for you as once you get to the property you are never going to want to leave! We very much look forward to returning many more times and our families can’t wait to join us! Walking the property, sitting with coffee on the terrace, reading in the hammocks, and swimming in the pool were some of our favourite moments. Also of interest, are the varieties of tropical flowers, the cactus garden and the fruit producing trees, with many banana palms, citrus and avocado trees. While were there the gardeners were planting papaya trees . The staff were all lovely, friendly and helpful . We managed quite well together, though we do not speak Spanish, with smiles, gestures , the odd word or two and the deepest gratitude for their commitment to the nature of their work . We thank Diego, for being there at the dock to meet our boat and help us carry our luggage and again on our departure . He was there promptly to fix the shower and whenever we saw him on the grounds , he always asked if everything was ‘muy bien ‘. Manuela and Michaela kept our studio fresh and clean with bi-weekly cleanings . The gardeners worked from early morning watering and tending the plants. There is an over all feeling that those who work at Villa Eggedal and indeed the owner , Erick, are happy and share a deep sense of pride and commitment to the property and their guests . Villa Eggedal and the hospitable community of Santa Cruz itself are already calling us to return. Stunning property and beautiful home with a great view. We have stayed here 5-6 times. It is always where we return when visiting the lake. We love coming back. Ramos, the caretaker, is a wonderful man. Deedle, the manager, is easy to work with. It is always a pleasure having people returning. Thank you so much for this review and hope to see you again before too long. We stayed at this amazing location for 8 days over Christmas. It did not feel long enough. This is an incredible property with amazing gardens and views to die for. The caretaker of this property Ramos is very helpful and we are grateful for his delivery of water each day. We loved our meals at the Iguana Perdida which is right off the dock and run by Deedle and Dave the managers of the property. We hope to be back to visit again soon. and pack light for minimum hardship in traveling by boat. There are some small restaurants within walking distance, too. Casa Wenche is a great value and a rejuvenating place to be. We recommend staying for several days to get the most out of it. Our only wishes for an even better stay would be for a stand-up fan in case of hot days and some screens on the interior windows to help keep the bugs out. Tony M.Where do you live? My wife and I rented this property for a week and both agree that it was worth every penny. The rooms and decor were great. The grounds and garden amazing. And the customer service all around from Deedle to Ramos and the girls who cleaned the house twice a week was nothing but professional. I would definitely return to this property if I find my self in Santa Cruz again. The view from outside our house of the two volcanoes was picture perfect! It was a pleasure having you to stay and hope that you will come back to visit again.